Big Sur is a region of the Central Coast of California. The place has no clearly defined boundaries, but it is believed that the region extends on 145 km of coastline between the Caramel River and San Caproforo. Big Sur extends about thirty kilometers to the east ridge of the hills of Santa Lucia. The north end of Big Sur is about 190 kilometers from San Francisco and the southern end - about 390 km from Los Angeles. Big Sur is where the mountain ridge seems to come out of the Pacific. 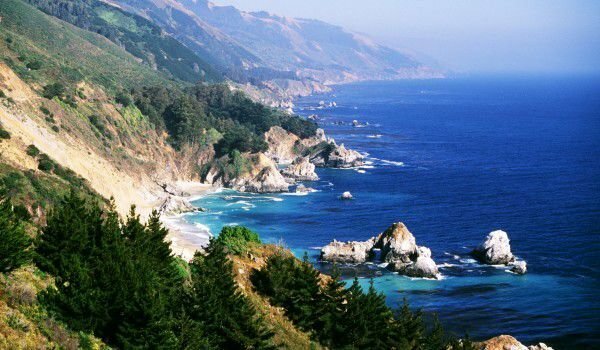 The name Big Sur is a mixture of English and Spanish and in translation means "the largest country in the south." The place is very picturesque and attracts millions of tourists each year who want to enjoy the beautiful views and to perpetuate a break. The highest peak is Cone Peak, which rises to 1571 m above sea level and is located just four kilometers eight hundred meters from the ocean. Big Sur was inhabited by Indians of different tribes and in 1830 the Spaniards arrived. They liked the place and settled there during the gold rush. The location was difficult to reach, yet industry entered at a rapid pace in Big Sur in the late nineteenth century. At that time the place was much more populated than it is now. The dangerous three-day trip to Monterey on land forced locals to bring their goods by water, because it was safer. Construction of the first highway in 1930 revolutionized Big Sur, making it much more easily accessible to all people. This does not appeal to locals and they protested against the government to keep Big Sur as a wild place where nature is untouched. Oldest of the time building is located in the Andrew Molera State Park, and the lighthouse there is the real attraction. Until then many people heated their homes and cooked with wood and coal, few were those who enjoyed electricity. In the mid-twentieth century, everyone in town already had electricity. In fact, construction of highways led the first tourists who streamed forth to the scenic views offered by Big Sur. In 1940 in Big Sur began to live the famous writer Henry Miller. He dedicated this period of his life to an autobiographical novel "Big Sur and the Oranges of Hieronymus Bosch". Today in Big Sur has a museum of Henry Miller. Big Sur served as the inspiration for many artists, including photographers, musicians and painters. The writer Jack Kerouac wrote a book called "Big Sur". There was a time when the area was known as a cult place for bohemians. Kerouac's novel "Big Sur" was released in 1962. After the unprecedented success of his book "On the road", the writer received a hard reputation and sought solitude in Big Sur. Unfortunately, this only deepened his depression. In 2012 his novel "Big Sur" was screened. In the Movie which retained the book’s original name starred famous actors Josh Lucas and Kate Bosworth. Today, Big Sur remains a favorite place for local and foreign artists from different fields. Big Sur is filled with a variety of parks that please the eye with their beauty. In Big Sur, you can see many beautiful plants, animals and rare birds. Here you can see giant salamanders, which often attack photographers with their cameras. Big Sur has a few small beaches, which are magnificent, but people do not like to bathe here, because sometimes the temperature falls sharply. The location is perfect for riding mountain bikes.